To brighten up a mid-week rainy day, I drove about thirty minutes east through the back roads of Northern Connecticut and Western Rhode Island to Wicked Tulips Flower Farm, the largest u-pick tulip field in New England. 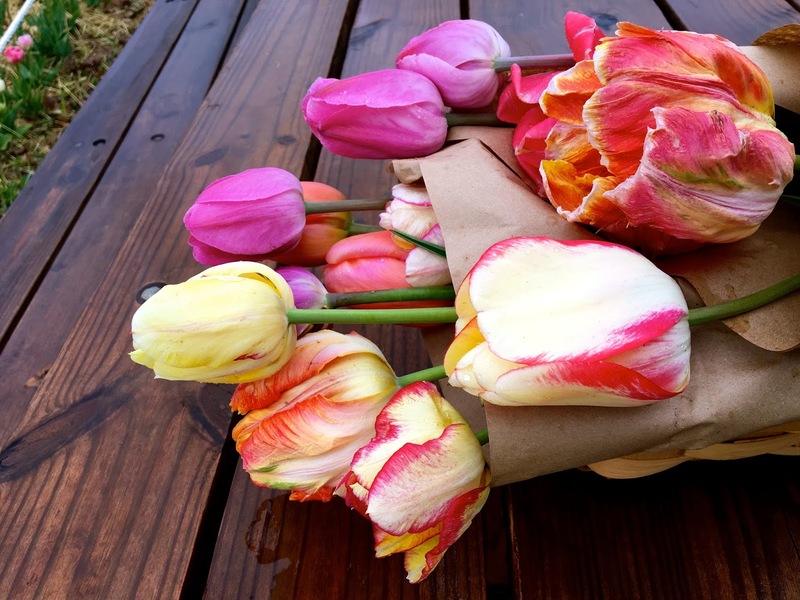 I found myself surrounded by row after row of whimsical, assorted tulips. Inspired by the vibrant bouquet I gathered for $1 a stem, I popped into my nearest grocery store on the way home to grab some bright veggies for dinner. 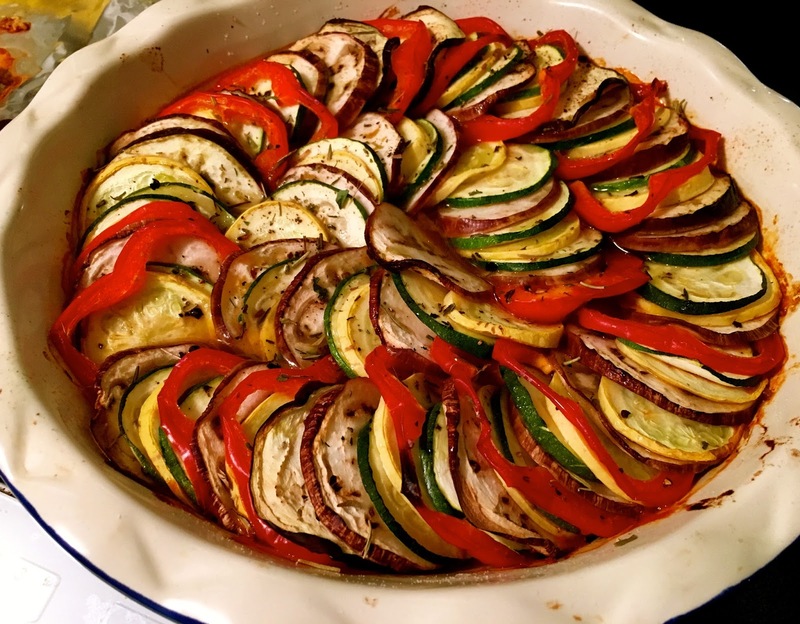 Ratatouille, (while is also one of my favorite animated movies), is a traditional French Provençal stewed vegetable dish that can be enjoyed in the spring or summer. I’ve had a mandoline in the back of my pantry, and thought this was the perfect opportunity to put it to use. The sharp blade created consistency and cut down the slicing time - I prepared my eggplant, zucchini, yellow squash and red peppers in record time. I then fanned the assorted circles around a seasoned baking dish and popped it in the oven. I enjoyed the dish on my patio alongside lemony herb coated haddock, a crusty baguette and crisp glass of Sauvignon Blanc. 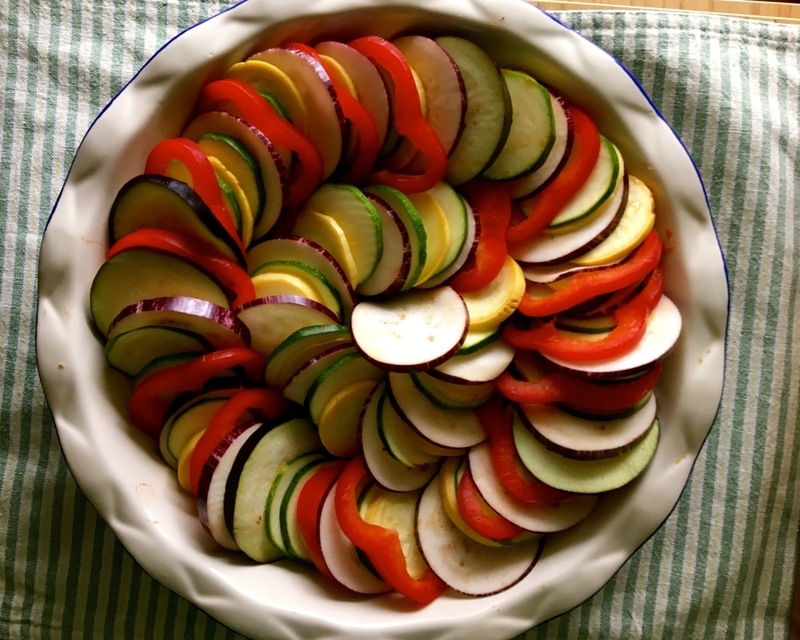 Pour 1/4 cup of EVOO into a circular or oval baking dish. Add the tomato puree, onion, garlic, 1/2 t oregano, red pepper flakes, salt and pepper and stir with a wooden spoon to combine. Trim the ends off the eggplant, zucchini and yellow squash. Trim the ends off the red pepper and remove the core, leaving the sides as is in a ring. 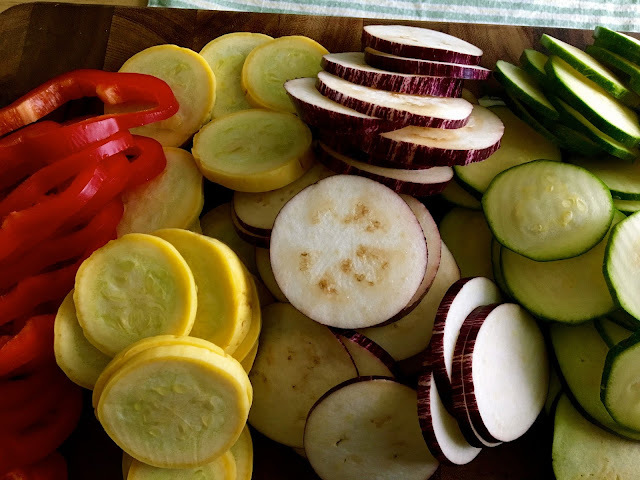 With a mandoline, (or sharp knife) cut the eggplant, zucchini, yellow squash and red pepper into 1/16-inch slices. Set aside. Fan the slices of prepared vegetables onto the tomato-covered baking dish starting from the outer edge and moving in, alternating and overlapping the veggies as you go. Have fun - this does not have to be perfect! Drizzle 1/4 cup of EVOO evenly over the vegetables and season liberally with lots of salt and pepper. Sprinkle the fresh thyme leaves and remaining dried oregano on top. Bake for approximately 45-50 minutes, until the veggies are tender, the sauce is bubbling up the sides, and the baking dish rim is bronzing slightly. ‘Tis the start of the season to celebrate fresh produce and color!